The year was 1985 (duh!). I was in a student in JHS 141 in the Riverdale section of the Bronx. I was at the movies (don't remember which movie I saw that day) and saw a trailer for a movie that would become my all time favorite movie. The trailer wasn't much really. Just someone walking down a road, shot from the legs down. Kicking a tire, then opening a car door and climbing inside. Then, this individual started punching in numbers into a keypad and reached for a pair of sunglasses. Next shot is from outside the car door. The window opens up and you see Michael J. Fox inside the car. You hear a woman asking him, "How far are you going?" to which he responds, "About 30 years" Then the familiar Huey Lewis and The News "Back In Time" song kicks in and you see the title "Back To The Future" coming soon across the screen. At first, it didn't strike me as a must see movie. I did enjoy Family Ties and thought Fox was hysterical in it, so I decided to see the movie when it came out. Heck, it had to be better than "Class of 1984", right? Not only was it better, it was down right awesome. The story was original, the acting was great and the effects for it's time was phenominal. Ok, maybe it wasn't "Star Wars" phenominal, but it was pretty cool, regardless. 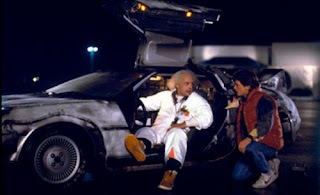 In case your not familiar with the plot of the movie (unless your 10 years old and under, you should know and any reason for not knowing is inexcusable), Fox plays Marty McFly, a teenager who is accidently sent back in time, from 1985 to 1955, in a time machine built out of a Delorean, built by his friend, Dr. Emmit Brown. There, he accidently bumps into his future dad, George, who is constantly bullied by Biff Tannen and his gang, and his future mom, Lorraine Baines, who falls in love with Marty. To get back to 1985, Marty enlists the help of Dr. Brown's 1955 counterpart and must get Lorraine to fall in love with George, all while keeping Biff from bullying George and pushing himself on Lorraine. 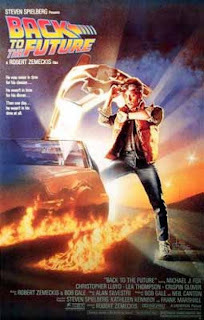 The film was the highest grossing movie of 1985, earning $380 million dollars worldwide. It won an Oscar for Best Special Effects and spawned 2 sequals. Most importantly, it became my all time favorite movie. I was riding a skateboard to school almost daily after seeing this movie. Michael J. Fox became, and still is, one of my all time favorite actors. I drove my mom nuts by watching this movie on video tape just about every chance I got. I even played the soundtrack over and over again on my walkman. There really hasn't been as much merchandise for this film as I would have liked to have seen. Yes, there has been Delorans of all diffrent sizes, T shirts, bubble gum cards, and even micro cars and gas station from Part II, but there never really has been a full scale line released for the movies. Once I heard Mattel had secured the rights, I was eagerly awaiting a time when I could add a Marty McFly figure to my collection. Or a Doc and Marty two pack along with the George and Loraine two pack. How about a skateboard made to look like a hover board? Of course, you release a Delorian or two, but I would love the train from Part III, which the bonus Clara figure. But so far, a SDCC diorama of the Clock Tower and Delorian released last year and a whole bunch of rumors. Come on, Mattel! The market is out there. Collectors want Back To The Future products. Get on the ball and get some stuff out there already. As much as I loved this movie, there are fans out there even more fanatical about this film than I am. I'm pretty sure there are those reading this who love the movie as much, if not more than I do. When I saw the movie on the big screen for it's 25'th Anniversery, the theather was sold out, with very little advertising on Universal's end. Only the die hards knew about. 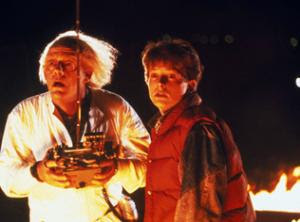 It just goes to show that a movie that almost had Eric Stoltz as Marty (what a diffrent film that would have been) still is beloved after almost 30 years later and the original fans are introducing the film to a whole new generation of future Back To The Future fans. This is one of those movies that will last a lifetime. Now, give us some toys, Mattel!